The third St Brigid’s Way walking pilgrimage sets off on 27 June from Brigid’s Well in Faughart Co Louth and nine days later ends at Brigid’s monastic city of Kildare. The revival of the ancient art of pilgrimage and ‘camino’ continues with the third St Brigid’s Way Celtic walking pilgrimage. It is to set off on 27 June from Brigid’s Well in Faughart, Co Louth and nine days later (Sunday 5 July) it will end at Brigid’s monastic city of Kildare where there is also a famous well. This pilgrimage connects two places sacred to St Brigid and gives people a chance to meander between ancient places on rural roads and off road paths. 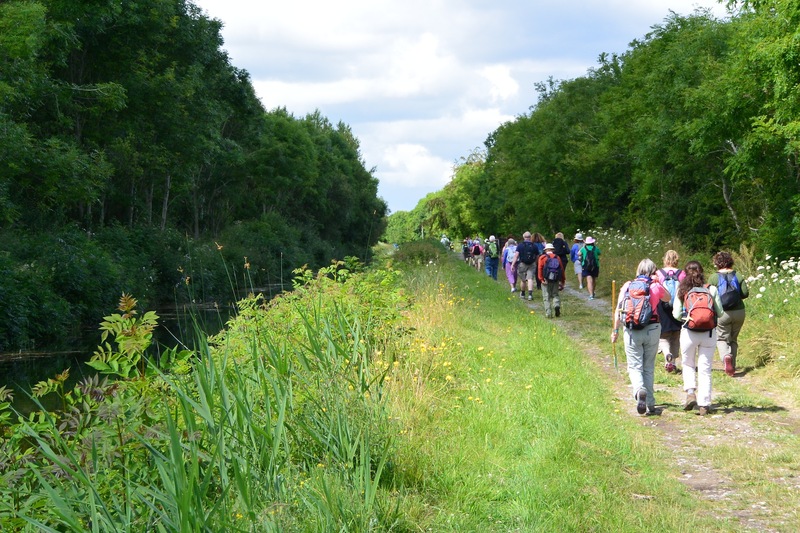 “Walking in pilgrimage allows participants to slow down the pace of life, enjoy the beauty of the countryside and listen attentively to the deep quiet voice within,” says Dolores Whelan, Celtic spiritual teacher. She and Karen Ward, author and holistic psychotherapist from RTE’s ‘Health Squad’ and BBC’s ‘Last Resort’, founded the pilgrimage 2013 – or they rediscovered it, as it includes some of the sacred places and old paths that Brigid once walked. The route is an alignment of ancient and sacred sites in Ireland which stretches from Brigid’s Well in Faughart, Co Louth to Kildare. This alignment was discovered by Anthony Murphy and Richard Moore during research for their book Island of the Setting Sun: In Search of Ireland’s Ancient Astronomers. This alignment of sacred sites reflects the Cygnus (Swan) constellation which was prominent in the skies at the time of Brigid’s birth in the 5th Century AD and is its reflection on earth of this heavenly configuration. The Brigidne Sisters who live in Kildare were delighted to see it set up and fully support it. They welcome the pilgrims to Solas Bhríde Centre, their new centre and hermitages in Kildare with refreshment at the last leg of their walk. While Dolores Whelan, who is also the author of ‘Ever Ancient, Ever New’, and Karen Ward and the Brigidines were there from the start, there is now a dedicated committee of volunteers who work all year round to organise the event. Some 100 people have travelled the way over the three years. “A wonderful experience of fellowship, celebrating our national goddess and female saint, and connecting with the Irish landscape and ancient celtic spirituality. I found it most healthy and enriching!” Alice, a pilgrim from Ireland has described her experience. The pilgrimage will wind its way through many places of spiritual and archaeological significance such as Newgrange, the Hill of Tara and Slane. This year, there will be a chance to sleep under the stars in Donadea Forest, Co Kildare. The walk will cover 10 to 12 miles each day at a leisurely pace. People from all walks of life, all spiritual traditions and age groups are welcome to join. Pilgrims can take part in all nine days or join for as many days as they wish. Many join for four days one year, and complete the other five the next. Others make a weekend of it, or simply join for one day. Each morning on the pilgrimage, there is a group warm-up and short prayerful meditation to set the intention for the day. There is a theme for each day to loosely guide the spiritual practice. The scheduled ceremonies are optional, but organisers aim that all ceremonies are welcoming to people with a belief or not. Celebrants include ordained Catholics, Interfaith Ministers and other leading spiritual teachers in Ireland. Organisers state that Brigid’s Way is not an ‘austere’ pilgrimage, and drivers can pick up someone who needs a break from walking. Luggage will be driven from one accommodation place to another. While walking pilgrims can make connection and hospitality from the Brigidine Sisters and team at the conclusion of the walk.